Hezbollah (“Party of God”) is a Lebanese political party and militant group with close ties to Iran and Syria’s Assad regime. It is frequently identified as an Iranian proxy, as the Party supports Tehran’s regional ambitions in exchange for military, financial, and political support.1 Hezbollah is the world’s most heavily armed non-state actor, and has been described as “a militia trained like an army and equipped like a state.”2 This is especially true with regard to its missile and rocket forces, which Hezbollah has in vast quantities arrayed against Israel. The continued growth of Hezbollah’s missile and rocket forces is undesirable for several reasons. It may, for example, embolden the party to overstep Israeli red lines. Hezbollah’s push to acquire longer-ranged and precision-guided munitions could likewise spur Israel into preemptive action. Hezbollah’s weapons acquisition also raises the prospects for the proliferation of missile technology and know-how. According to Saudi and UAE officials, Hezbollah militants have worked with their Houthi forces in rocket development and launch divisions.6 Hezbollah forces in Syria and Iraq similarly operate with various Shiite militias. Growing relations among these groups presents risks for the dissemination of missile technology and knowledge. 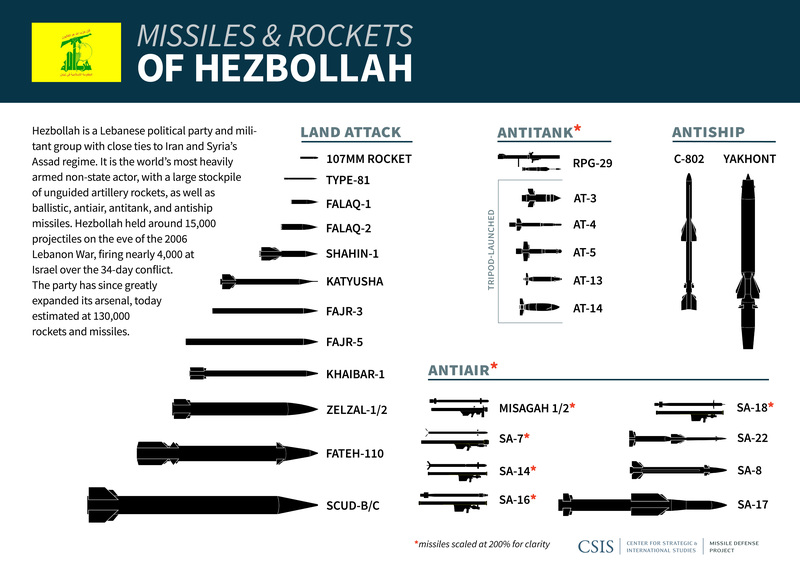 Note: This is not a definitive list of Hezbollah’s rocket arsenal, and the profiles below rely solely on open-source material. Falaq is a family of unguided surface-to-surface artillery rockets developed by Iran in the 1990s. They are sometimes identified as Falagh. The Soviet Union sold Uragan rockets and launcher systems to Syria, which then transferred a number of these rockets to Hezbollah in the early 2000s. Hezbollah’s launchers differ from the standard Soviet design, as one analysis explains: “[O]nly one layer of four tubes rather than the standard three layers, two with six tubes and one with four.”30 Hezbollah likely made this change to accommodate a lighter launch vehicle. The Khaibar-1 was first fired by Hezbollah on July 28, 2006, striking the city of Afula. Subsequent targets included Haifa, Hadera, and areas in the northern West Bank. The Fateh-110 is an Iranian short-range, road-mobile ballistic missile. It is most likely a modified version of the unguided Zelzal-2, with the addition of control and guidance systems. The M-600, or “Tishreen,” is a Syrian variant/copy of the Fateh-110 missile. Scuds variants have ranges between 300-550 km while carrying a 600-985 kg payload. Standard versions measure 10.3-12.29 m in length, with a body diameter of 0.88 m and launch weight of around 5,400-6,500.50 If Hezbollah does indeed have Scuds, it could use them to reach Israeli targets from Party-controlled territory in northern Lebanon. The C-802 is a medium-range antiship cruise missile (ASCM) developed by China in the 1970s-1980s. Iran began buying dozens from the Chinese during the 1990s until the United States pressured Beijing to cease sales.51 Iran then developed its own variant, the “Noor”, and transferred it to Hezbollah.52 Hezbollah’s C-802s are likely maintained and operated by Iranian military personnel. The Yakhont is an antiship cruise missile (ASCM) developed by Russia in the 1990s. It can be air-, ground- or sub-launched. Russia delivered 72 Yakhont coastal defense missiles to Syria in December 2011, along with 18 TEL vehicles. Additional shipments of more advanced, radar-equipped variants followed in May 2013.57 Syria transferred a number of these systems to Hezbollah. As of January 2016, the United States estimates that Hezbollah possesses up to 12 Yakhont ASCMs.58 However, reports suggest that Hezbollah does not have the means to launch the missile without Iranian and/or Syrian support.59 Israel considers the Yakhont one of the main threats it faces from Hezbollah, as the missile threatens shipping along Israel’s entire coastline and could complicate any potential blockade of Lebanon. The AT-5 Spandrel is a semi-automatic command to line of sight (SACLOS) wire-guided anti-tank guided missile (ATGM) developed by the Soviet Union in the late 1960s and early 1970s. The AT-5 has an effective range of 4 km and armor penetration of more than 750 mm.73 An Israeli report suggests that Iran provided Hezbollah with domestic copies of the AT-5. Most of Hezbollah’s antiair missile systems offer only a relatively small area of protection. They nevertheless force Israeli aircraft to fly at higher altitudes, reducing Israel’s ability to accurately strike ground-based targets.80 Israeli policymakers and military officers have consistently reiterated their concerns about Hezbollah acquiring more sophisticated air defenses from Bashar al-Assad’s Syria. The ZU-23 is a stationary unit with twin 23 mm anti-aircraft guns developed by the Soviet Union in the 1950s. It was designed to engage low-flying targets at a range of 2.5 km and a maximum altitude of 1.5 to 2 km. It can also target armored vehicles up to a 2 km range. The ZU-23 has a length of 4.57 m, a width of 1.83 m, a height of 1.87 m, and a barrel length of 2.01 m.85 Hezbollah air defense units reportedly station ZU-23 assets on flatbed trucks to add mobility.86 ZU stands for “Zenitnaya Ustanovka,” which translates to “anti-aircraft self-propelled system.” The missile is is alternatively known as the ‘2A14 ZU-23-2’ and ‘Sergey’. The SA-17 is a medium-range air defense system developed by Russia in the early 1990s. It holds four ready-to-launch missiles, which can engage targets at a 50 km range at an altitude of 10 to 24 km.96 The SA-17 is designed to protect ground troops and can be moved by a collection of vehicles and trailers, making it difficult to target. Shaan Shaikh, "Missiles and Rockets of Hezbollah," Missile Threat, Center for Strategic and International Studies, June 26, 2018, last modified October 30, 2018, https://missilethreat.csis.org/country/hezbollahs-rocket-arsenal/. J. Michael Cole, “Opening Pandora’s Box: If Israel Strikes Iran, What About Hezbollah?” The Diplomat, October 13, 2012, https://thediplomat.com/2012/10/opening-pandoras-box-hezbollah-in-israels-iran-thinking/. Steven Erlanger and Richard A. Oppel Jr., “A Disciplined Hezbollah Surprises Israel With Its Training, Tactics and Weapons,” New York Times, August 7, 2006, http://www.nytimes.com/2006/08/07/world/middleeast/07hezbollah.html?pagewanted=all. Center for Preventive Action, “Israel and Hezbollah: Deterrence and the Threat of Miscalculation,” Council on Foreign Relations, September 11, 2017, https://www.cfr.org/report/israel-and-hezbollah-deterrence-and-threat-miscalculation; International Crisis Group, “Israel, Hizbollah and Iran: Preventing Another War in Syria,” February 8, 2018, https://www.crisisgroup.org/middle-east-north-africa/eastern-mediterranean/syria/182-israel-hizbollah-and-iran-preventing-another-war-syria. Udi Dekel et al., The Quiet Decade: In the Aftermath of the Second Lebanon War, 2006-2016,” Institute for National Security Studies, July 2017, 120, http://www.inss.org.il/wp-content/uploads/2017/07/memo167_6.pdf. Eric Goldstein and Bonnie Docherty, “Civilians under Assault: Hezbollah’s Rocket Attacks on Israel in the 2006 War,” Human Rights Watch, August 28, 2007, https://www.hrw.org/report/2007/08/28/civilians-under-assault/hezbollahs-rocket-attacks-israel-2006-war. Ellen Francis and Laila Bassam, “Lebanon’s Hezbollah denies sending weapons to Yemen,” Reuters, November 20, 2017, https://https://www.reuters.com/article/us-mideast-crisis-syria-nasrallah/lebanons-hezbollah-denies-sending-weapons-to-yemen-idUSKBN1DK22D. Human Rights Watch, “Q & A: 122mm Cluster Munition Rockets,” October 19, 2006, https://www.hrw.org/news/2006/10/19/q-122mm-cluster-munition-rockets; William M. Arkin, Divining Victory: Airpower in the 2006 Israel-Hezbollah War, (Maxwell Air Force Base: Air University Press, 2011), 56, https://books.google.com/books?id=Q-NiAwAAQBAJ&pg=PA35&lpg=PA35&dq=Hezbollah+Fajr-5&source=bl&ots=pYWo8nRcZZ&sig=zQnmVCQ58vnDJ5TU0x0SnytQ6Ag&hl=en&sa=X&ved=0ahUKEwiIl6CM7KzXAhWr6IMKHVW_Aco4ChDoAQhRMAc#v=onepage&q=Hezbollah%20Fajr-5&f=false. Human Rights Watch, “Q & A: 122mm Cluster Munition Rockets”; Israel Missile Defense Association, “Grad Katyusha,” June 13, 2007, http://imda.org.il/english/Threats/threats_missile.asp?missileid=10. David Schapiro and Katherine Zimmerman, “Estimates for Hezbollah’s Arsenal,” AEI Critical Threats June 29, 2010, https://www.criticalthreats.org/analysis/estimates-for-hezbollahs-arsenal#_ednaa371eb0fcd676f2aa5b2de7656fc4ed4. Patrick Devenny, “Hezbollah’s Strategic Threat to Israel,” Middle East Forum, Winter 2006, http://www.meforum.org/806/hezbollahs-strategic-threat-to-israel. BBC News, “Hezbollah’s rocket force,” July 18, 2006, http://news.bbc.co.uk/2/hi/middle_east/5187974.stm; Robert Wall et al., “Harsh Trajectories,” Aviation Week, August 7, 2006, http://archive.aviationweek.com/issue/20060807. James Klatell, “Hezbollah’s Rocket Science,” CBS News, July 20, 2006, https://www.cbsnews.com/news/hezbollahs-rocket-science/. Army Recognition, “Type 63 107 mm Multiple rocket launcher system,” April 4, 2011, https://www.armyrecognition.com/china_artillery_vehicles_and_weapon_systems_uk/type_63_107_mm_multiple_rocket_launcher_system_data_sheet_specifications_information_description_uk.html; Jane’s Artillery & Air Defence, 275. N.R. Jenzen-Jones, Yuri Lyamin, and Galen Wright, “Iranian Falaq-1 and Falaq-2 Rockets in Syria,” Armament Research Services, May 2014, http://www.armamentresearch.com/wp-content/uploads/2014/01/ARES-Research-Report-No.-2-Iranian-Falaq-1-Falaq-2-Rockets-in-Syria.pdf. Anthony Cordesman, “Iran’s Rocket and Missile Forces and Strategic Options,” CSIS, October 7, 2014, 54, https://csis-prod.s3.amazonaws.com/s3fs-public/legacy_files/files/publication/141007_Iran_Rocket_Missile_forces.pdf. Jane’s Artillery & Air Defence, 292-293. Yossi Melman, “Hezbollah Expected to Launch 100 Missiles a Day at Tel Aviv,” Haaretz, April 8, 2011, https://www.haaretz.com/israel-news/haaretz-wikileaks-exclusive-hezbollah-expected-to-launch-100-missiles-a-day-at-tel-aviv-1.354826. BBC, “Hezbollah’s rocket force”; Jane’s Artillery & Air Defence, 290. BBC, “Hezbollah’s rocket force”; Jane’s Artillery, 288-290. Benjamin Lambeth, “Air Operations in Israel’s War Against Hezbollah: Learning from Lebanon and Getting It Right in Gaza” (Rand Corporation: 2011), 94, https://books.google.com/books?id=IT4rB0V6fDQC&pg=PA92&lpg=PA92&dq=Zelzal+1&source=bl&ots=bkh-32_XZA&sig=wOolW9JUqnXtBVTcZBucvAKJAIc&hl=en&sa=X&ved=0ahUKEwjzsJX7jI_XAhWD0iYKHVFqDCU4ChDoAQhCMAU#v=onepage&q=Zelzal%201&f=false. SBS News, “Rocket barrage hits Israel,” February 24, 2015, https://www.sbs.com.au/news/rocket-barrage-hits-israel. Human Rights Watch, “Civilians under Assault”; Sergey V. Gurov, “BM-27 Uragan,” Military Today, http://www.military-today.com/artillery/bm27_uragan.htm. Yuri Lyamin and N.R. Jenzen-Jones, “Assessment of the Khaibar-1 Rockets Captured by the IDF,” Armament Research Services, March 12, 2014, http://armamentresearch.com/assessment-of-the-khaibar-1-rockets-captured-by-the-idf/. Stratfor, “Examining Hamas’ Rockets,” July 10, 2014, https://worldview.stratfor.com/article/examining-hamas-rockets#axzz367gaGV7K?utm_source=twitter&utm_medium=official&utm_campaign=link. Gili Cohen, “Hamas Firing Long-range M-302 Rockets at Israel, Capable of 150-km Distance,” Haaretz, July 9, 2014, https://www.haaretz.com/israel-news/1.603957. Lambeth, Air Operations in Israel’s War Against Hezbollah, 92-93. Jane’s Artillery & Air Defence, 290-291. Nicholas Blanford, “Warriors of God: Inside Hezbollah’s Thirty-Year Struggle Against Israel,” (New York: Random House Publishing Group, October 2011), 338, https://books.google.com/books?id=lJWGvIcmODoC&pg=PA337&lpg=PA337&dq=Hezbollah+Uragan&source=bl&ots=zBUq1-aea2&sig=wa0aUucgc1JitWX4ZQtojH56mJA&hl=en&sa=X&ved=0ahUKEwiCyaGVg6DXAhWBx4MKHf9lCg4Q6AEITjAJ#v=onepage&q=Hezbollah%20Uragan&f=false. Anthony Cordesman, “The Lessons of the Israeli-Lebanon War,” CSIS, March 11, 2018, slide 17, https://csis-prod.s3.amazonaws.com/s3fs-public/legacy_files/files/media/csis/pubs/080311_lessonleb-iswar.pdf. Seymour Hersh, “Watching Lebanon,” The New Yorker, August 21, 2006, https://www.newyorker.com/magazine/2006/08/21/watching-lebanon; Mark W. Pontin, “The Missiles of August,” MIT Technology Review, August 16, 2006, https://www.technologyreview.com/s/406282/the-missiles-of-august/. Jonathan Lis and Amos Harel, “Syria Gave Advanced M-600 Missiles to Hezbollah, Defense Officials Claim,” Haaretz, May 5, 2010, https://www.haaretz.com/news/syria-gave-advanced-m-600-missiles-to-hezbollah-defense-officials-claim-1.288356. Tamir Eschel, “Iran: We supplied ballistic guided rockets to Hezbollah,” Defense Update, November 24, 2014, http://defense-update.com/20141124_fatah110.html#.VH47w8IcQdU. Daniel Kurtzer, “A Third Lebanon War,” Council on Foreign Relations, July 2010, https://www.cfr.org/sites/default/files/pdf/2010/07/CPA_contingencymemo_8.pdf. Mona Alami, “Hezbollah Rocket Inventories Worry Israel, U.S.,” Inter Press Service, May 2, 2010, http://www.globalissues.org/news/2010/05/02/5455. Missile Threat, “SS-1 (Scud A/B/C/D),” last updated August 11, 2016, https://missilethreat.csis.org/missile/scud/. Mark Mazzetti and Thom Shanker, “Arming of Hezbollah Reveals U.S. and Israeli Blind Spots,” New York Times, July 19, 2006, http://www.nytimes.com/2006/07/19/world/middleeast/19missile.html. Andrew McGregor, “Hezbollah’s Tactics and Capabilities in Southern Lebanon,” Jamestown Foundation, August 1, 2006, https://jamestown.org/program/hezbollahs-tactics-and-capabilities-in-southern-lebanon/. “CSS-N-4 ‘Sardine’ (YJ-8/YJ-8A/C-801); CSS-N-8 ‘Saccade’ (YJ-82/YJ-83/C-802/C-802A/Noor/Ghader),” in IHS Jane’s Weapons: Naval 2016-2017, ed. David Ewing & Malcolm Fuller (United Kingdom: IHS, 2016), 3-7; Cordesman, “The Lessons of the Israeli-Lebanon War,” slide 48. Uzi Rubin, “Hizballah’s Rocket Campaign Against Northern Israel: A Preliminary Report,” Jerusalem Center for Public Affairs, August 31, 2006, http://jcpa.org/article/hizballahs-rocket-campaign-against-northern-israel-a-preliminary-report/. Missile Threat, “SS-N-26 “Strobile” (P-800 Oniks)/ Yakhont / Yakhont-M / Bastion (launch systems),” last updated December 2, 2016, https://missilethreat.csis.org/missile/ss-n-26/. J. Dana Stuster, “Why Hezbollah’s New Missiles Are a Problem for Israel,” Foreign Policy, January 3, 2014, http://foreignpolicy.com/2014/01/03/why-hezbollahs-new-missiles-are-a-problem-for-israel/. Darien Cavanaugh, “Russia is teaching Hezbollah some terrifying new tricks,” War is Boring, January 27, 2016, http://theweek.com/articles/601435/russia-teaching-hezbollah-some-terrifying-new-tricks. Cordesman, “The Lessons of the Israeli-Lebanon War,” slide 45. Ben Hubbard, “Iran Out to Remake Mideast With Arab Enforcer: Hezbollah,” New York Times, August 27, 2017, https://www.nytimes.com/2017/08/27/world/middleeast/hezbollah-iran-syria-israel-lebanon.html?action=click&contentCollection=world&module=NextInCollection&region=Footer&pgtype=article&version=series&rref=collection%2Fseries%2Ftehran-turn&mtrref=undefined. Cordesman, “The Lessons of the Israeli-Lebanon War,” slide 43. Arkin, Divining Victory, 38. One theory asserts that this operation was actually conducted by Hamas militants, trying to renew fighting between Israel and Hezbollah. John Pike, “AT-4 SPIGOT Anti-Tank Guided Missile,” Federation of American Scientists, January 22, 1999, https://fas.org/man/dod-101/sys/land/row/at4spigot.htm. Yuri Lyamin et al., “Introduction to the 9M113 Konkurs ATGM,” Armament Research Services, July 28, 2016, http://armamentresearch.com/introduction-to-the-9m113-konkurs-atgm/. Jonathan Marcus, “Tough lessons for Israeli armour,” BBC, August 15, 2006, http://news.bbc.co.uk/2/hi/middle_east/4794829.stm. BBC, “Tough lessons for Israeli armour”; Blanford, Warriors of God, 338. “Merkava v Kornet E ATGM,” Al Jazeera video on YouTube, June 5, 2010, https://www.youtube.com/watch?v=RzVEduKGUws. Josh Cohen, “If Russia Is Supplying Weapons to Hezbollah — Watch Out,” War is Boring, February 17, 2016, http://warisboring.com/if-russia-is-supplying-weapons-to-hezbollah-watch-out/. Robert Beckhusen, “Israel Plans to Counter Hezbollah With Hundreds of Surface-to-Surface Missiles,” War is Boring, December 31, 2016, https://warisboring.com/israel-plans-to-counter-hezbollah-with-hundreds-of-surface-to-surface-missiles/. Adam Rawnsley, “Iran-Backed Terror Group Parades New Anti-Aircraft Missiles in Iraq,” War is Boring (Medium), March 19, 2015, https://medium.com/war-is-boring/iran-backed-terror-group-parades-new-anti-aircraft-missiles-in-iraq-ca0204079eb0. Army Recognition, “Misagh-1 Man portable air defence missile system,” January 5, 2012, https://www.armyrecognition.com/iran_iranian_army_missile_systems_vehicles_uk/misagh-1_man_portable_air_defence_missile_system_technical_data_sheet_specifications_pictures.html; Jane’s Artillery & Air Defense, 620-622. Army Recognition, “Misagh-2 Man portable air defence missile system,” January 5, 2012, https://www.armyrecognition.com/iran_iranian_army_missile_systems_vehicles_uk/misagh-2_man_portable_air_defence_missile_system_technical_data_sheet_specifications_pictures.html; Jane’s Artillery & Air Defence, 620-622. Jane’s Artillery & Air Defence, 590-592. Jane’s Artillery & Air Defence, 647-649. Jane’s Artillery & Air Defence, 490-494. Army Recognition, “Israeli Army believes Hezbollah has obtained SA-8 Russian air defence missile from Syria,” January 25, 2012, https://www.armyrecognition.com/january_2012_army_military_defense_industry_news/israeli_army_believes_hezbollah_has_obtained_sa-8_russian_air_defence_missile_from_syria_2501123.html. Yifa Yaakov et al., “US official: Israel hit Hezbollah-bound missiles in Syria,” Times of Israel, October 31, 2013, https://www.timesofisrael.com/israel-attacked-twice-in-syria-destroying-sa-8-missiles/. Jane’s Artillery & Air Defence, 650-652. Judah Ari Gross, “If Hezbollah has the SA-17, it’s a ‘big deal,’ expert says,” Times of Israel, April 8, 2016, https://www.timesofisrael.com/if-hezbollah-has-the-sa-17-its-a-big-deal-expert-says/. Gabe Fisher, “Israeli jets reportedly attack convoy on Lebanon-Syria border,” Times of Israel, January 30, 2013, https://www.timesofisrael.com/israeli-jets-reportedly-penetrate-lebanese-airspace/. Missile Threat, “Pantsir S-1,” last updated May 4, 2017, https://missilethreat.csis.org/defsys/pantsir-s-1/. Amos Harel, “At UN, Netanyahu Reveals Details on Hezbollah Weapons Acquisitions,” Haaretz, October 2, 2015, https://www.haaretz.com/israel-news/.premium-1.678540.